After six years of working at Liberty Market, Dad moved on to Gateway Market on 12th Street and continued to work as butcher. Eddie Tom who owned Eddie’s Market on 73rd Avenue was looking for a young butcher to help in the meat section of his store. The local corner stores served the needs of the community within walking distance. You could buy meat, vegetables, drinks, candy, milk, and soap. And you didn’t have to get in your car to buy those items. Eddie knew one of the workers at Liberty who recommended my Dad for the job. Even though the job was outside of Chinatown, Dad took the job. By that time, he had a wife and me, and my brother on the way. 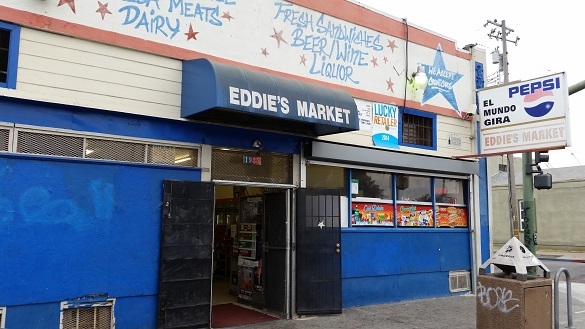 After a couple of years, Eddie sold the business to my Dad, wanting to focus on the grocery side of things. Dad now owned Don’s Meats which operated inside Eddie’s Market. My memories of my father as a butcher always originate inside Eddie’s Market. The shop would open every day, 365 days a year, at 9 am and didn’t close until 7 pm. On a handful of holidays like Thanksgiving or Christmas, he’d work a shorter day, closing at 4pm. It was a hard life for my parents. I didn’t actually recognize how hard it was until I was a graduate student in Boston. I visited them on spring break and helped out at the shop. Working only a few hours in a hot shop, I was beat. When I went back to school, I started complaining about how expensive lunch was and realized I was reacting to my parents sacrifice. After 22 years, I finally got it. Boy, was I spoiled! Don’s Meat was located on a busy street known as 73rd Avenue, between the famously crime-ridden East 14th and Bancroft Avenue. It wasn’t as dangerous back then. We lived a mile or so away from the shop, across from Eastmont Mall. They don’t call it that now. When you live in a bad neighborhood, people are always renaming stuff trying to make it sound better than it really is. East 14th became International Blvd. Eastmont Mall became Eastmont Town Center. Read Part 1, Part 3, Part 4 and Part 5 In part 3, I will share my story about my Dad and his relationship with Otto Schaefer. I drove down 73 everyday on the way to work for 15 years. It is a small world sometimes.